UK: The UK continues to steadily increase the rate of building new wind farm capacity in 2010, with around 1.5GW already under construction and due for completion before the year's end. This follows the country's best year yet for new build, having achieved the milestone of completing more than 1.1GW in 2009 - 828MW onshore and 284MW offshore. It brings UK capacity to almost 4.1GW, 3.4GW of it onshore and 700MW offshore. At the start of the year, the government also announced the successful bidders to take forward the UK's third round of offshore development, which could lead to a 32GW increase in offshore capacity. Even so, there remains a further 3.2GW of consented onshore wind projects that have yet to move into construction. These are delayed for a variety of reasons. Some have consents that are conditional on resolving objections from aviation organisations concerned about the turbines' effects on radar; other projects are awaiting grid connection; while securing finance has been a problem for many of the smaller independent developers. Gordon Edge, director of economics and markets at the British Wind Energy Association, points out that many of the onshore wind farms built last year were sustained by large utilities with big balance sheets. In recent years, around 60% of new construction was project-financed, the rest was financed on utilities' balance sheets. That has changed in the current difficult financial climate, with just a handful of project financings since 2008, Edge says. Compounding the lack of finance has been the poor sterling-euro exchange rate, which increases the cost to UK customers of wind turbines - all of which are manufactured overseas. But Edge reports progress on a number of these issues. A deal brokered last year by the UK government between the European Investment Bank (EIB) and three national banks should see £1.4 billion of loans to small onshore projects totalling more than 1GW, due to start in the near future. "The banks say they are ready to go," Edge says. "With all the money they have, there really ought to be some projects in the ground before too long." Meantime, industry and aviation bodies are now collaborating to resolve aviation problems. Around half of all projects in the planning system are stalled by objections from air traffic control, airports or the Ministry of Defence on the grounds of radar interference, obstruction or impact on low flying. Among a raft of initiatives, the industry and government are funding research into solutions to the problem of radar interference. Prospects for grid access are set to improve too. The UK government has decided to adopt a connect-and-manage approach to grid access, allowing new projects to be connected in advance of planned upgrades being built. System operator National Grid will then constrain generating plants at times when the network is overloaded. And earlier this year the Scottish government gave its long-anticipated consent for an upgrade to the Beauly to Denny transmission line. This paves the way for 1.5GW of wind in the north of Scotland to proceed immediately under the connect-and-manage approach, with more gigawatts of capacity to follow when the line is built. "We (the wind industry) tend to beat ourselves up about the problems for onshore wind, but constant chipping away at all these issues means we can ramp up installation beyond one gigawatt a year from 2015," Edge predicts. However, one big question mark hanging over the sector is who will emerge victorious from the general election in May. A new centre-right Conservative government could stop support to onshore wind if it follows the recommendations of a recent policy review, which advised replacing the renewables obligation with a system of fixed-price tariffs. Moreover, the report claims wind is now at market competitiveness and should no longer receive support. Wind operators are enjoying rates of return "hitting 25%", it states. Edge refutes the report's claims. The rates of return for onshore wind projects are more likely to be in the range of 10-15%, he says. Nonetheless, he remains optimistic about the prospects for wind under a future Conservative government. Despite the party's sideswipes at the sector while in opposition, a dose of the realities of government would modify its renewables policies, he believes. He points out that the next government will inherit tough targets for carbon reduction and renewables. "The Conservative front bench get the message that they cannot do this without onshore wind," he says. The UK's record tally in 2009 comprises 42 onshore wind farms totalling 828MW and two offshore projects giving 284MW. As in recent years, Scotland leads the table with 64% of last year's new onshore capacity and is now home to the largest wind farm in the UK - and, indeed, in Europe. 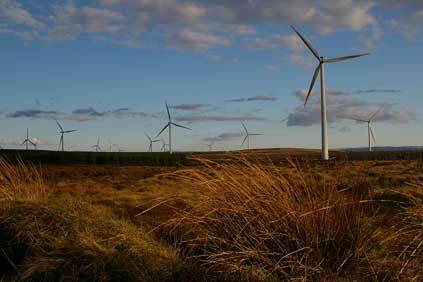 This is ScottishPower's Whitelee project, which added 322MW to the UK total when it was fully commissioned in May. England managed 20% of 2009's onshore capacity, but its share is boosted to 40% when offshore wind is taken into account. Northern Ireland, the UK's smallest country in both population and land area, achieved 9.5%, while Wales, as usual, lagged behind its neighbours with 6%. Whitelee, together with the offshore projects, boosted Siemens' share of wind turbine capacity to 58% of the market last year. Its nearest manufacturing rival was Nordex with just 14%. Making its debut in Britain was Alstom subsidiary Ecotecnia at ScottishPower's 15MW Clachan Flats wind farm. Also in its first UK appearance was Dutch newcomer EWT at the 2.7MW Castle Pill wind cluster which is owned by Infinergy - itself a subsidiary of Dutch construction group Koop Holding. A low point of 2009 was the closure of turbine giant Vestas' blades factory on the Isle of Wight, off England's south coast, which followed an earlier withdrawal from its assembly plant at Campbeltown in Scotland. The company pinned the blame for its decision to pull out of the UK on the British contruction permitting system. Meanwhile, a key event of 2009 was the government's strategy for meeting the UK's legally binding EU target of providing 15% of its energy from renewables by 2020. This will require a higher contribution from the power sector of around 30% of electricity to compensate for the expected lower levels of delivery from the heat and transport sectors. Wind is expected to provide the lion's share of the renewables goal, supplying over 26GW by 2020 - more than 20% of the UK's electricity. To provide extra financial incentives the government is to extend the country's support mechanism - the renewables obligation - from its current cut-off date of 2027 to 2037. The obligation requires electricity retailers to source a rising proportion of their power from renewables. They comply by buying renewables obligation certificates from renewables generators or pay a penalty for any shortfall.